Meet Blue Coat Chef Tina. She’s been a beloved member of the Blue Coat Army since 2014. Chef Tina was formally trained through the Le Cordon Bleu program. Her specialties include Asian cuisine, Mexican cuisine, and her famous banana bread. When the sweet smell of her banana bread permeates through the Chapter House, you better watch out because you might get run over by the stampede of girls running to the kitchen. 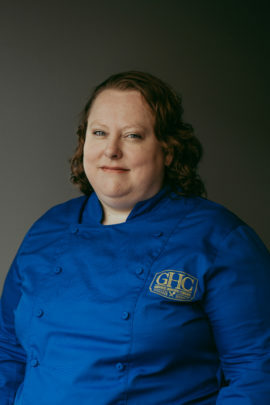 She found her home with GHC as a sorority Chef. Her passion for cooking and love for her chapter shows every day when she walks into her kitchen and buttons her chef coat. Tina shared that her favorite GHC memory is when one of her sorority members sprinted into her kitchen to give her a big hug shouting, “I love you Tina” because she put her favorite dish on the menu for dinner that night.